On the face of it you can see why Burkina Faso lacks mainstream appeal: a landlocked West African nation with rowdy neighbours, this country has a harsh climate, unforgiving geography and an infrastructure few would want to be at the mercy of. Set piece attractions are also lacking. Yet Burkina Faso remains an enthralling destination for intrepid travellers, thanks to its wonderful inhabitants and dramatic landscapes. As such, the country, though not frequently visited, is a fine place in which to immerse yourself in West African culture. Meaning “land of the honest people,” Burkina Faso proudly proclaims to be one of the friendliest countries in Africa – and visitors are sure of a warm welcome. Burkinabé, as the people of Burkina Faso are known, are the exact opposite of the harsh land that they inhabit – and it is these cordial and courteous people who make coming here such a joy. Burkina Faso’s traditional cultures are best sampled in its two largest cities: the fabulously named capital, Ouagadougou (also known as “Ouaga”) and the second city of Bobo-Dioolasso (simply referred to as “Bobo”). Both have large communities of artists, particularly Ouagadougou, which is famed for its music scene. The art and architecture of the capital are also worthy of attention, with several largescale sculptures enlivening the streets. Away from the cities, Burkina Faso’s four national parks harbour a surprising diversity of wildlife. If you can’t explore them all, then do make a beeline for Arli, which is home a wide range of ecosystems and is an important habitat for West Africa’s last big cats and elephants. Hippos, monkeys and various exotic bird species also call this national park home. 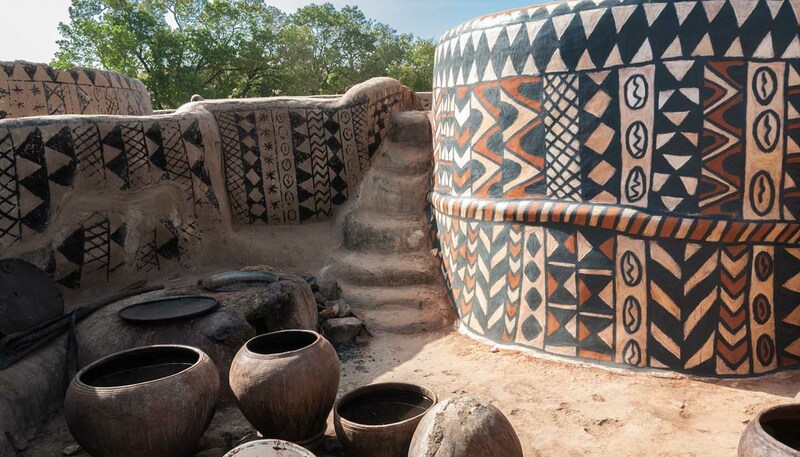 Burkina Faso might not suit first time travellers, but for hardy adventurers this is a destination in which to veer off the tourist trail and discover the hidden gems of West Africa. 274,200 sq km (105,870 sq miles). President Roch Marc Christian Kaboré since 2015. Prime Minister Christophe Dabiré since 2019. The FCO advise against all but essential travel to the rest of Burkina Faso, including the capital Ouagadougou. Terrorists are very likely to try to carry out attacks in Burkina Faso, including Ouagadougou. On 31 December 2018, the President of Burkina Faso declared a partial state of emergency covering the whole of the Est and Sahel regions, the western provinces of Kossi and Sourou, the central-eastern province of Koulpélogo, the western province of Kénédougou and northern province of Lorum. This followed a terrorist attack in Sourou province on 27 December, which killed 10 gendarmes. The measure gives security forces extra powers to search homes and restrict freedom of movement. The state of emergency was extended on 11 January by Parliament for a further 6 months. In March 2018, a terrorist attack took place on the French Embassy and the Army Headquarters in Ouagadougou. 16 people were killed, including 8 attackers, and 80 people injured. In May 2018, a shootout occurred on the outskirts of the city between security forces and terrorists suspected of being linked to March attack. In August 2017, gunmen attacked the Aziz Istanbul restaurant in Ouagadougou. In January 2016, there was a terrorist attack against a hotel and café in central Ouagadougou. Further attacks are possible. You should exercise particular caution around religious holidays. There have also been regular attacks on Burkinabe security forces. On 28 August, 7 members of the security forces were killed after their vehicle was struck by a roadside bomb near Fada N’Gourma in the Eastern Region. There have also been recent attacks on police and military personnel close to the borders with Mali, Niger and Cote d’Ivoire. You should take extra care and follow the instructions of the security authorities. There’s also a risk that terrorist groups may cross the border from Mali and the northern border with Niger into Burkina Faso to carry out kidnap attacks. UK health authorities have classified Burkina Faso as having a risk of Zika virus transmission. For information and advice about the risks associated with Zika virus, visit the National Travel Health Network and Centre website. If you’re abroad and you need emergency help from the UK government, contact the nearest British embassy, consulate or high commission. Consular support is limited in Burkina Faso. The Honorary Consul in Burkina Faso can offer limited consular assistance. British nationals should contact the British High Commission Accra in Ghana who can provide consular support. Terrorists are very likely to try to carry out attacks in Burkina Faso, including the capital Ouagadougou. Burkina Faso contributes to the UN peacekeeping initiative in Mali (MINUSMA) and is therefore considered a legitimate target by Al-Qaida in the Islamic Maghreb (AQ-M) and its associated groups. On 18 September 2018, armed, masked men purporting to be members of AQ-M posted an online video announcing their presence in Burkina Faso. There have been regular attacks on police, military personnel and civilians, particularly close to the borders with Mali, Niger and Cote d’Ivoire and in the Eastern Region. On 15 September 2018, 2 terrorist attacks in the far east of Burkina Faso killed at least 9 civilians. On 28 August 2018, 7 members of the security forces were killed after their vehicle struck a roadside bomb near Fada N’Gourma. On 11 August 2018, 4 gendarmes and a civilian were killed when their vehicle struck a mine about 100 kilometres (60 miles) from Fada N’Gourma. Further attacks are possible and could occur without warning. You should be vigilant, monitor local media and follow the advice of the local authorities. There have also been attacks in the capital, Ouagadougou. In March 2018, an attack took place on the French Embassy and the Army Headquarters. 16 people were killed, including 8 attackers, and 80 people injured. In May 2018, Burkinabe security forces engaged the suspected attackers in the Rayongo district, on the outskirts of the capital. Three suspected terrorists were killed, and 5 gendarmes and 1 civilian wounded. Weapons and bomb-making materials were found at the scene. In August 2017, gunmen attacked the Aziz Istanbul restaurant in Ouagadougou. 19 people were killed, including 9 foreigners. A terrorist attack took place at a hotel and restaurant in central Ouagadougou in January 2016 in which 30 people were killed, including a number of foreigners. Further attacks are possible. You should exercise particular caution around religious holidays. There remains a continuing high threat of kidnap in Burkina Faso and the wider Sahel region. On 15 January 2019, a Canadian citizen was kidnapped near Gayeri in the Est region and found dead near the Niger border 2 days later. In mid-December 2018, a Canadian and Italian went missing in southwest Burkina Faso and this case is being treated as a kidnap. In September 2018, 2 foreign nationals were kidnapped in the far north by an armed group. In January 2016, 2 western nationals were abducted in the northern town of Djibo near the border with Mali, one of whom has since been released. A number of hostages kidnapped in Burkina Faso are still being held by terrorist groups. This threat is likely to continue as groups remain intent on demonstrating capability and increasing influence across the region. In March 2017, AQ-M Sahel, Ansar al-Dine and al-Murabitun merged into the new group ‘Jamaat Nusrat al-Islam wal Muslimeen’, demonstrating their continued intent to conduct attacks and kidnaps across the region. There is a good chance that AQ-affiliate JNIM will continue to target foreign nationals. See our Sahel page for information on the regional threat. Those engaged in tourism, humanitarian aid work, journalism or business sectors are viewed as legitimate targets. If you’re kidnapped, the reason for your presence is unlikely to serve as a protection or secure your safe release. Security precautions do not mitigate the threat. You should maintain a high level of vigilance at all times. Further kidnaps are likely. There is a heightened threat of terrorist attack globally against UK interests and British nationals, from groups or individuals motivated by the conflict in Iraq and Syria. Find out more about the global threat from terrorism, how to minimise your risk and what to do in the event of a terrorist attack. There is a risk of armed groups stopping vehicles (including public buses) on major roads to rob them, particularly at night. Street crime poses high risks for visitors. Most incidents involve opportunist snatches of purses, wallets, jewellery and other valuables. Thieves are particularly active in crowds. The areas near and around the UN Circle and the former Central Market in Ouagadougou experience the highest amount of street crime. You should take sensible precautions. Don’t carry valuables in public places or walk alone at night. British nationals are increasingly being targeted by scam artists operating in West Africa. The scams come in many forms: romance and friendship, business ventures, work and employment opportunities, and can pose great financial risk to victims. You should treat with considerable caution any requests for funds, a job offer, a business venture or a face to face meeting from someone you have been in correspondence with over the internet who lives in West Africa. You should avoid travel between towns by road at night, particularly from Bobo Dioulasso to Côte d’Ivoire, and Fada to Benin and Togo, due to a history of incidents in these areas. Incidents are not confined to principal routes. Secondary roads (notably roads in the east to Benin, Bogande and Gayeri) are also affected. You should also take care if you are travelling by road between Burkina Faso and Niger. You should travel in convoy where possible and seek local advice before setting out. Where possible you should follow a police patrol. Armed roadside banditry is a problem across the country, and the number of attacks is increasing. Drivers who have refused to stop for robbers have been shot at. Remote and border regions are particularly vulnerable but there have been attacks on the main road between Ouagadougou and Bobo-Dioulasso. You can drive in Burkina Faso using a UK driving licence. With a few exceptions, roads are poor with few street lights. There is a risk of banditry and hitting stray livestock. Road conditions off the main roads are often difficult, especially in the rainy season (June-September). Vehicles do not always have headlights and are often in poor condition. Stay on clearly marked roads or tracks and avoid minor roads in remote areas unless travelling in convoy. If you break down off a main road you may not be able to attract help. Carry drinking water with you. Burkina Faso has a large Muslim population. You should respect local traditions, customs, laws and religions at all times. You should be aware of your actions so that they don’t offend others, especially during the holy month of Ramadan or if you intend to visit religious areas. Don’t get involved in drugs of any kind. If you commit a criminal offence you can expect to be subjected to local law. Penalties can be severe. Convicted offenders can expect heavy fines and long jail sentences. Local prison conditions are harsh. Burkina Faso’s custom authorities may enforce strict regulations concerning export from the country of items like masks, religious materials and antiquities. Exporting art objects is subject to the prior approval of the Ministry of Culture. Don’t photograph military or other government installations. If you’re a tourist, you no longer need to get a photograph permit from the Tourist Office but there remains a list of prohibited buildings/installations for which film crews still need permits. Mobile phone networks can be unreliable especially outside towns and cities. Carry ID (passport or residence permit) at all times. You’ll need a visa to enter Burkina Faso. If you live in the UK, you should apply for a visa direct from the Embassy of Burkina Faso in Brussels. Contrary to the information on the Embassy’s website, there is currently no other method of obtaining a visa for Burkina Faso in the UK. There are also Burkinabe Embassies in the region, including in Accra and Abidjan. UK Emergency Travel Documents (ETDs) are accepted for entry, airside transit and exit from Burkina Faso. There has been an outbreak of dengue fever in Burkina Faso during 2017. You should follow the advice of the National Travel Health Network and Centre. Malaria and other tropical and water-borne diseases are common. The rainy season normally runs from June to October. Torrential rains can cause floods and landslides. Monitor local weather reports and expect difficulties when travelling to affected areas during this season. Credit cards are accepted by a few of the larger hotels and restaurants in Ouagadougou. You are unlikely to be able to use them anywhere outside the capital. Other brands of credit cards are not accepted. There are a few ATMs in Ouagadougou (Visa only). Travellers’ cheques are exchangeable in banks in Ouagadougou. Euro travellers’ cheques are exchanged at the fixed rate prevailing between the CFA Franc and the Euro. Exchange rates on travellers’ cheques in other currencies can be poor. In general, and in particular outside Ouagadougou, you should make sure you have enough cash to cover any eventuality.